A hydrating selection of silky textured fusion oils allows you to choose your destination while enjoying the journey through the essence of Africa. The oils can be used neat on the skin or alternatively be added to a running bath while promising to coat the skin in a protective, soothing envelopment. 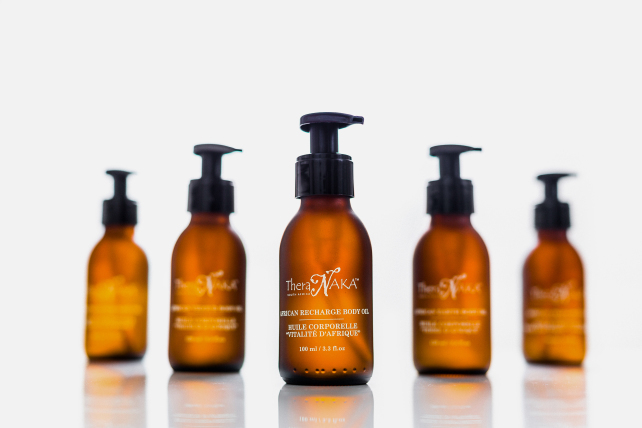 Essential oils are purposefully grouped to achieve various psychological effects while the skin benefits from the healing powers of the Marula tree. Description: : A silky textured body oil that purifies the soul and improves poor circulation. The African herbal fusion provides a detoxifying, decongesting and diuretic effect to help cleanse mind, body and soul. Important Ingredients: Marula Oil, Fennel, Ginger. Description: A powerful synergy of Rosemary, Pine, Black Pepper and Marjoram combined in a unique satin smooth Almond and Wheatgerm base. This invigorating blend helps to stimulate circulation whilst relieving muscle tension. Important Ingredients: Marula Oil, Rosemary, Pine, Marjoram, Peppermint, Black Pepper. Description: A soothing botanical synergy of Baobab oil and Neroli that helps to relax and create a sense of harmony of the body and mind.